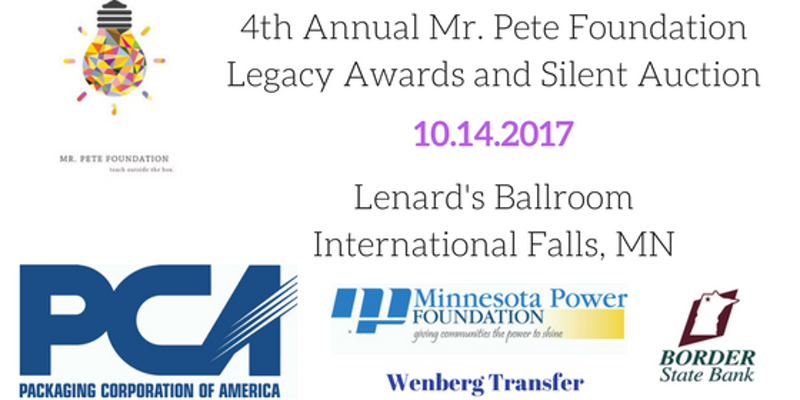 Tickets are now available online for our 4th Annual Legacy Awards and Silent Auction! Purchase them before September 21st for a $5 discount! Grab a ticket for yourself for $30 or purchase a whole table of eight for $210! CLICK HERE to nominate a teacher for the Legacy Award. A lot of his Players he coached in Peewees and Bantams will be getting you some items to the foundation shortly, and we also have a check for the foundation that will be sent out! Ex-Players- Mike Bolstad, Bruce Raboin, Neil Sheehy, Bob Mason, Bill Mason, Tommy Herzig, Paul Nevanen, Todd Pavleck, Robin Anderson, Gerald Bolstad, Geno Rohl, David Laurion, Kelly Meyers, Jonny Austin and Andy Shermoen and Michaels Long time co-coach Terry “Krazy” Thompson!! God Bless you all! Thank you so much Mike! We appreciate it! Are you going to post some pictures from the auction? I heard it was just wonderful. I was so sorry to miss it. Hey Peg! Next year! We uploaded the pictures we got to an album on Facebook. Go Like Mr. Pete Foundation!